Casumo offers players a truly unique casino experience. Be prepared for something completely different at Casumo. Casumo casino is colourful, playful and full of little surprises and extras. At Casumo it is not just about playing casino games. It is about having a lot of fun doing so. Playing at Casumo is indeed an adventure. The selection of games is awe-inspiring, with a wide variety of the best software providers. If you like playing the slots, you can choose from over 1,000 great slot titles. If you prefer table games, Casumo has also got you covered with over 50 table games, including American, European and French roulette, (live) blackjack, baccarat, video poker and Caribbean Stud Poker. But besides these very impressive casino offerings, you can earn extra bonuses called valuables. These consist of additional treasures in your account which you can access at any given moment. Valuables include free spins, deposit bonuses, free play and much more and are earned by reaching certain levels, after specific accomplishments or as a signup bonus. This system works very well as you frequently gain more valuables and do not have to use them straight away if you choose. Some do expire, though, so make sure you check out your valuables from time to time. You also get the opportunity to enter the Casumo Challenge, a race between you and all other Casumo’s (players) where big cash prizes are up for grabs. The Casumo Challenge is always free and lots of fun. Casumo offers a very impressive array of slots from the world’s best providers, such as Netent, Quickspin, Microgaming, Play’n GO, Thunderkick, WMS, Push Gaming, Bally, Barcrest, ShuffleMaster and IGT. Discover over 1,000 of the best casino slots including Gonzo’s Quest, Dead or Alive, and Tiger’s Glory, amongst others. Or take a crack at the hugely popular high variance slots like Primal Megaways or Raging Rhino, with its thrilling free spins bonus with multipliers up to 81x and 1024 ways to win. If you have a desire to become a millionaire overnight, you might want to try out one of Casumo’s many progressive jackpot slots: there are 14 different progressive jackpots waiting to be won, including Hall of Gods, Mega Fortune, Cosmic Fortune, Keno and Carribean Stud Poker. Casumo also offers some great Live Casino games, from Evolution Gaming. Play all your favourite Live Casino games, including Lightning Roulette, Live Blackjack, Live Dreamcatcher and even some games that you can only find at Casumo. Before you can withdraw your bonus money, it needs to be wagered. All bonuses must be wagered 25 times (deposit + bonus) and free spins winnings 30 times. You can make a withdrawal before you have fulfilled the wagering requirement, but then you will lose your bonus money. Slots contribute 100% towards the wagering requirement. Video poker 30% and roulette, blackjack and baccarat contribute 0%. All other games contribute 100%. Casumo may be too cheerful and different for some, but we love it. It has a very friendly vibe, lots of bonuses and an incredible selection of slots and table games. All in all, Casumo is a great casino with a very fresh outlook on how players need to be treated. Withdrawals are executed fast and without hassle, which is also a great plus. 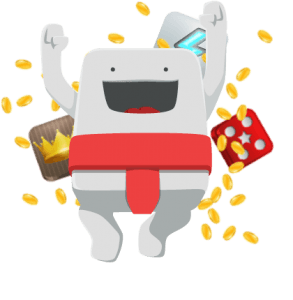 If you have an E-wallet account such as Skrill or Neteller, winnings will be transferred to your E-wallet within a few hours after you clicked on the withdraw button, sometimes even less. Try Casumo now and get a 200% bonus up to $€50 and 200 free spins!